New homes seem to be gaining ground in Portsmouth. Today's buyer can choose between a house, townhome or condo close to the harbor. The options seem endless when listings are pulled for this location. Owners can rest easy knowing new construction homes are made from materials with the latest safety features. They also get the benefit of less maintenance, as newer homes don't need constant repairs like some older houses do. Buyers get to live in residences with the most fashionable designs and hottest décor trends. No updating will be necessary for quite a while. Three local developments offer homebuyers residences which deserve some consideration. The first stop on this tour of new homes is First Watch at Riverpointe. Each single-family house or townhome in this Portsmouth development can be attractive to potential owners. Homes may include garages, walk-in closets, porches, built-in pantries and lofts. Convenience is the keyword here because this neighborhood is located right off of Route 164 and minutes from Interstates 664, 264 and 64. Residents can reach Suffolk, Norfolk and other cities of Hampton Roads quickly and easily. Low-maintenance is key here as this is a condominium community where owners can take their weekends back. Homebuyers can enjoy an on-site clubhouse and lighthouse too. Buyers can find a wide variety of new homes in New Port at Victory. This Portsmouth community is comprised of both attached and detached types of housing. Considering a townhome? 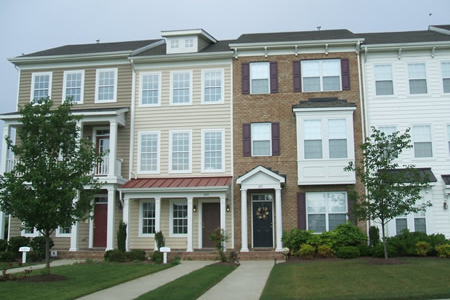 Builders here offer two and three-story townhomes with different layouts to please many types of buyers. Features may include eat-in kitchen, custom cabinetry, Delta faucets, Kenmore appliances, two-car garage and gas fireplace. If a single-family house is more to your liking, they are available too. This neighborhood also comes with perks like a pool with waterslide, playground, picnic area and community grill. Each townhome is as spacious as some houses so the choice will depend on personal preference. Finally the new homes tour brings buyers to The Homes of Belle Hall. The detached houses here combine affordability with style so this can be a nice place for first-time homebuyers. This Portsmouth development is a prime location for those who want to be close to city amenities. Homes here may come with professional landscaping, kitchen pantries, garbage disposals, GE appliances, elongated toilets and brushed nickel light fixtures. Let one of our agents help when one of these neighborhoods feels like the right fit.